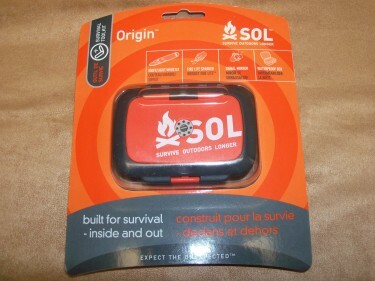 The SOL Origin is the first of several survival kits we’ll be reviewing this month. The Origin came on the market a year or two ago and I’ve been wanting to play around with one since I first saw it online. The SOL Origin is what we call a mini kit. It actually is sort of a commercial version of the vaunted Altoids tin kits many of us have made over the years. As you can see, it isn’t much bigger than one of those tins. Despite the small size, the SOL Origin is packed with features. At the top, you’ll find a fold out signal mirror, complete with instructions for use. Attached to the bottom are several tools, all of which slide out from recessed slots for ease of use. First, we have a liquid filled compass. We also have a Fire Lite Striker, which tosses out fairly decent sparks for lighting fires. The gray surface you see on the side of the striker is a rubber pad which helps with sliding the striker from the slot on the bottom of the Origin. Finally, we have a multi-function device. It has a small, yet very sharp, blade, an LED light, and a 100db signal whistle, all in one handy item. For those keeping score at home, we have a fire starter, a knife, a navigation tool, a light, and two methods of signaling for help, and we haven’t even opened the lid yet! On the underside of the lid, there is a small pamphlet containing 62+ survival tips, written by Buck Tilton. –A small fishing/sewing kit with safety pins, sewing needle, sinkers, hooks, fishing line, and leaders. The black strap you see in the pic is a wrist strap that attaches to the outside of the box. The box itself is fashioned out of hard plastic and the interior is waterproof. All told, it weighs in at around 6 ounces. So, what did I think of the SOL Origin? While it has a lot of stuff included, none of it appears very high end. I’d swap out the nylon cord for paracord, for starters. The Fire Lite Sparker works great, as do the Tinder Quik tabs. The signal mirror is functional but being attached to the box, it can be a little cumbersome to use properly. The storage space inside the box is a bit less than you’d have in an Altoids tin kit. With the items that are included with the Origin, there isn’t much room for customization. Having several of the tools affixed to the bottom of the box saves space inside, of course, but again, there just isn’t much of any empty space left to add your own items. Missing from the kit are a couple of essential items–an emergency blanket and some means of water purification. But, slipping a space blanket in your pocket along with a few water purification tablets solves that problem. Better yet, pick up an Aqua Pouch with Water Purification Kit. There are also no provisions for first aid in the SOL Origin. A few adhesive bandages and a small pouch of pain relievers might fit into the box, though. All in all, the Origin has the feel of a toy, more than anything else. While all the items included are indeed functional, it feels less like a survival kit than it does something you’d buy your kids to use when they’re playing in the woods. Which, come to think of it, might be exactly why you’d want to pick up an SOL Origin. The kit is small enough and light enough that a youngster could keep it in their pocket or in a belt pouch when you’re hiking or camping. Teach your child how to properly use each of the kit’s components and they’ll have the tools necessary to stay alive if they get lost in the woods overnight. The SOL Origin wasn’t a disappointment nor would I not recommend it. It would make for a great kit for kids as well as perhaps a starter kit for someone who wants some piece of mind when out hiking. If you don’t want to take the time to assemble your own mini kit, this is a great option. You can pick up the SOL Origin at Amazon for under $30.